Most Canadian cyclists trade in their wheels for a transit pass when it gets cold – but a growing number are braving the roads year-round. They explain why, and offer some tips for winter cycling. Thousands of Canadians cycle in the summer, and cities like Calgary, Toronto, Montreal, Vancouver and even Yellowknife and Whitehorse, with tiny populations in comparison, are continually adding more bike infrastructure. But when temperatures fall below 0 C, most people trade their bike for a transit pass or car. 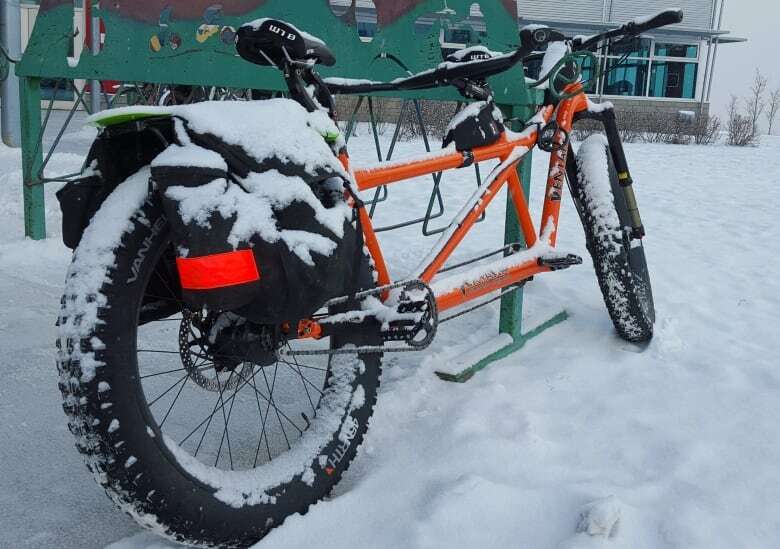 About 30 to 40 per cent of cyclists bike year-round, according to Tom Babin, the Calgary author who wrote Frostbike: The Joy, Pain and Numbness of Winter Cycling, and some say that percentage grows every year. "I don't think we're ever going to get the same number of people riding in the winter that do in the summer," says Babin. "But every time I speak to someone who tried it, [they] said it's a lot easier than they thought it would be." Babin says it's helped him to rediscover the joy of winter. "It's quiet, the snow is falling — it can have really beautiful moments … and it's good for me, it gets me exercise, and it lets me see my city in a better way," he says. Cassandra Drudi started winter cycling during the 2008-2009 transit strike in Ottawa. Buses didn't run for weeks in the middle of a very snowy winter. Without a car, cycling was her only option. "There was a certain level of bad-assery to it," she says. "It felt pretty amazing when you get to work and you're like, 'I completed a mission,' and it's something most people think is insane." She now lives in Toronto and plans to cycle this winter with her two-year-old son. Julian Kanigan has cycled in Yellowknife — home to brutal winters — for 15 years. He says it's just more convenient. "Everything is super close in Yellowknife so it almost makes more sense to ride a bike," he said. And there's the added benefit of exercise, he says, and he doesn't have to worry about parking. For others, it's more reliable than transit. "The predictable travel times are worth their weight in gold … you know how long it's going to take to get from point A to point B," says Yvonne Bambrick, the author of The Urban Cycling Survival Guide. Both Babin and Bambrick say they see more people riding in the winter every year. If it's so great, then why don't more people do it? There are practical reasons people don't cycle in the winter: slippery roads, low visibility and snow on streets can force drivers and cyclists to share a narrower space. But it's difficult to gauge if it's statistically more dangerous. An Ontario coroner's report found that the majority of cycling deaths happen in the spring and summer months — only nine per cent of cycling deaths happened in January, February and March in the province between 2006 and 2010. However, those numbers don't account for the drop in the number of cyclists on the road in the winter. 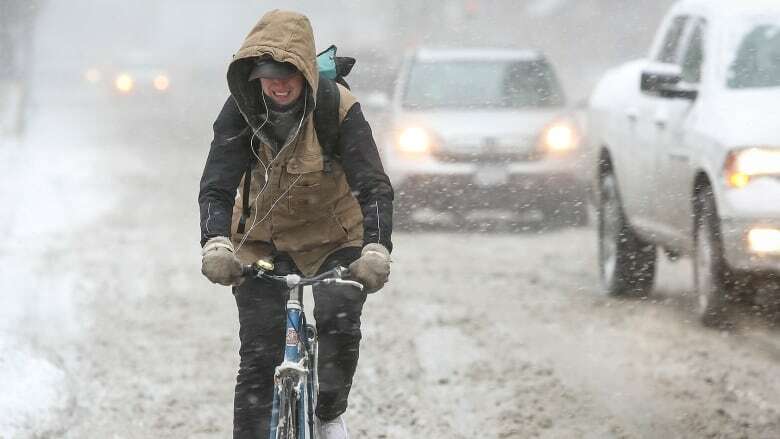 Babin attributes the fewer number of winter cyclists to a fear of the season. "We've really lost our connection to winter because we've gotten so good at avoiding it. You really can go all winter without ever getting outside and I think that sort of bred a bit of fear inside all of us," he says. Drudi says that while she felt pretty tough after cycling through that Ottawa winter, she says it's really not extreme. "I commute in winter here [in Toronto] and co-workers thought I was crazy. But then my boss started doing it and other people started doing it. It seems like a crazy act but really, it just needs to be normalized," says Drudi. "You need some padded, insulated gloves, a good warm hat, good warm socks to keep the extremities of the body warm. And one of my favourite pieces of gear is a wool long-sleeve shirt that I'll wear underneath a sweatshirt," says Dave Currie, master mechanic at Mountain Equipment Co-op in Toronto. "I wear a black winter coat. It's stylish, I like it, but it's black. So I wear a safety vest over top of that — I'm doing my part to be a bit more visible," says Bambrick. Currie suggests changing from smooth to "knobby" tires. And studded tires are great for cities that get a lot of ice, something Kanigan in Yellowknife and Babin in Calgary use. Summer cyclists usually get a tune-up once a year. Currie suggests year-round cyclists tune up every few months because winter can be tough on bikes. Some, like Babin and Bambrick, use a "beater" bike (albeit a well-functioning one) for the winter. "I always say, there's no need to be a masochist about the whole thing. You don't have to ride every day," says Babin. Even he doesn't ride in some conditions.